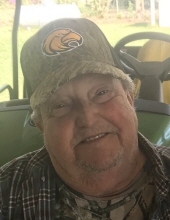 Charles H. Smith, 80, of Wade, MS passed away in his home surrounded by his family on Friday, February 1, 2019. Harold was born on February 5, 1938 to the late James M. and Ruby E. Smith in Wayne County, MS. He worked for several years at Ingalls Shipbuilding, before joining the United States Air Force, where he served as a flight engineer during the Vietnam War. After eight years of service, he began his career at Chevron Refinery in Pascagoula as an operator until his retirement. He was an avid hunter, he especially enjoyed bow hunting. He also enjoyed fishing and camping with his family. Harold leaves to cherish his memories his loving wife of 61 years, Joann Smith; daughter, Carla Smith McGrath; grandchildren, Jason “Jay” McGrath Jr. and Jourdan McGrath; brother, Thomas “Tommy” (Gloria) Smith; nieces, Debbie Kay (Jay) Loris, Tammy McQueen, and Carol Ann (Russell) Kennedy; along with many other family members and friends. The visitation for Harold will be held on Wednesday, February 6, 2019 from 6:00 p.m. until 8:00 p.m. at Heritage Funeral Home in Escatawpa, MS. The funeral service will be held on Thursday, February 7, 2019 in the funeral home chapel beginning at 12 noon. Interment will follow at Serene Memorial Gardens. To send flowers or a remembrance gift to the family of Charles Harold Smith, please visit our Tribute Store. "Email Address" would like to share the life celebration of Charles Harold Smith. Click on the "link" to go to share a favorite memory or leave a condolence message for the family.